The Alabama Foreign Corporation (Business or Non-Profit) Application for Registration must be filled out and submitted to the Alabama Secretary of State in order to operate a nonprofit corporation. This is a straightforward form however several requirements must be met. This form must be submitted with two copies and must be accompanied with payment for the state processing fee ($150.00 payable to “Secretary of State”). 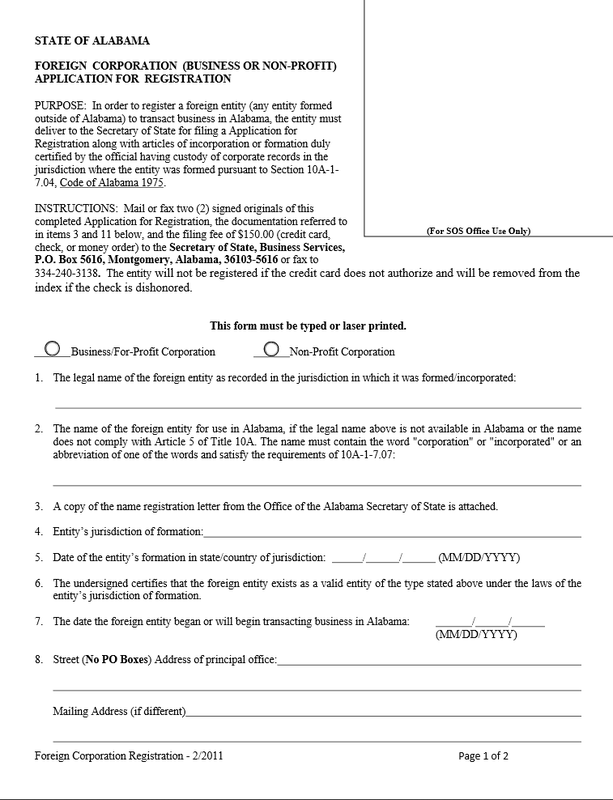 Also, since this is a foreign corporation, a copy of the certificate of formation from the issuing state and a name registration letter from the State of Alabama Secretary of State must also be included. These are the minimum requirements which must be met but depending on your situation more may be required. 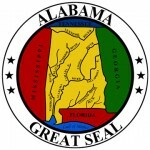 The name registration letter may be obtained through this online application: https://www.alabamainteractive.org/sos/welcome.action. Make sure you are abreast of local as well as state level requirements concerning the nature of your nonprofit and its structure. This form may not be filled out by hand. It must be typed or printed using a laser printer. Step 1 - On the first page, locate the bubble labeled “Non-Profit Corporation,” then fill it in or place a mark in it. Step 2 - Now, in the first item, report the legal name of your nonprofit in its entirety as it is listed on the certificate of formation obtained from the original issuing Secretary of State (or similar entity). 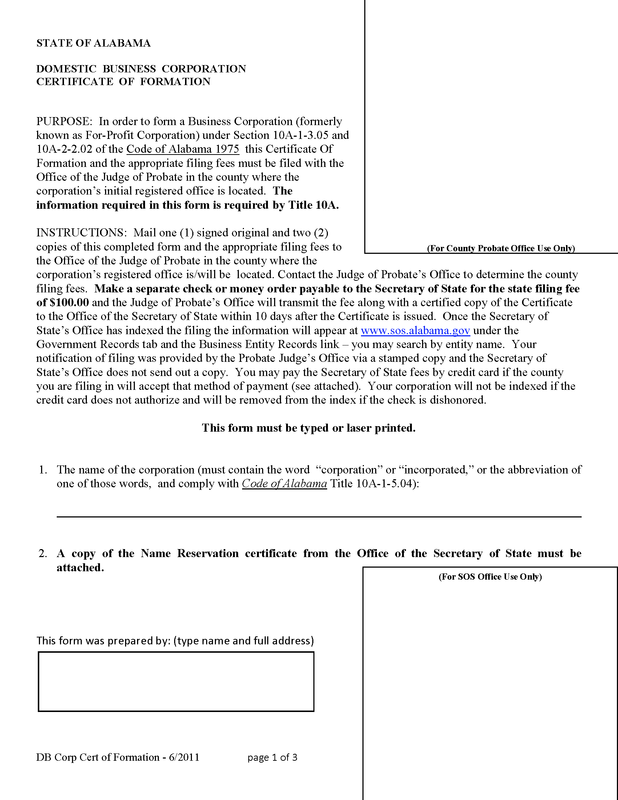 Step 3 - The name of your nonprofit in this state must be compliant with Alabama State Code Title 10A and must be unique. If you have had to obtain a different name from the State of Alabama, report this name in the second item. Step 4 – In the fourth item, report the jurisdiction your nonprofit was originally formed in. Step 5 - In item 5, enter the date your nonprofit was formed as it is listed on your original certificate of formation. 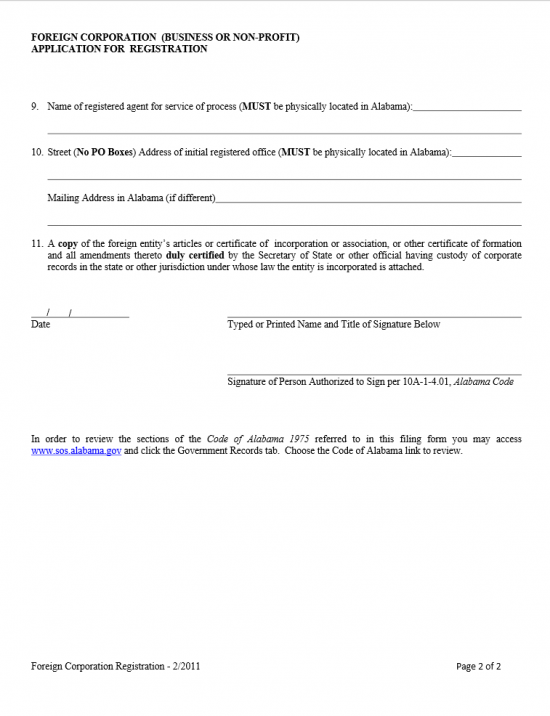 Step 6 - In the seventh item, report the date your nonprofit should be operating in the State of Alabama. Step 7 - In the eighth item on this page, enter the street address of your principal office. Note: If your principal office has a mailing address that differs from the street address, you must provide this address in the space provided as well. Step 8 - Report the identity of your nonprofit’s registered agent in the ninth item. Step 9 - In the tenth item, write out the full street address of the nonprofit’s registered agent. If this entity has a different mailing address, enter this in the space provided. Note: The registered agent must have a physical address in Alabama. 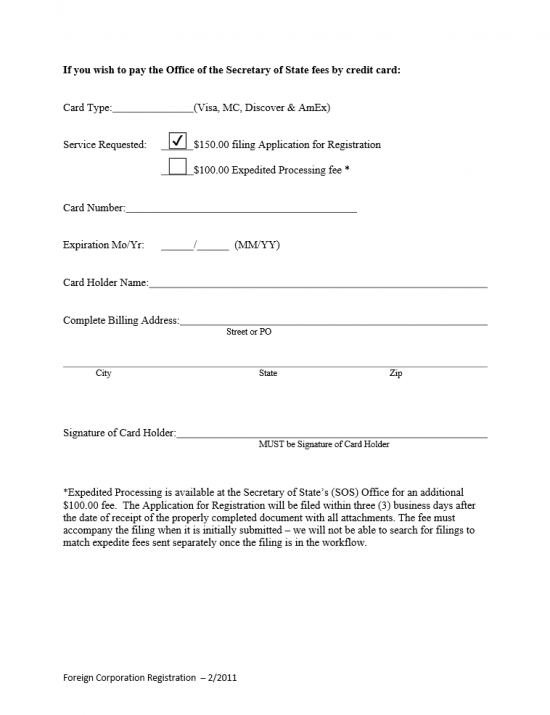 Step 10 - The organizer of this application must provide the date he or she have filled out the form, his or her name printed out (by typewriter or laser printer), and his or her signature. These are all required by Alabama State Code 10A-1-4.01. Step 11 - If you wish to pay by credit card, rather then by check or money order, proceed to the next page. First, enter which credit card will be used to submit payment. If you wish to have this expedited (this will cost and additional $100.00) then check the second box in the service section. On the next few lines, in this order, enter the credit card number, credit card expiration date, card holder’s name, and the credit card’s billing address. The card holder must sign the bottom of this page.